I hate that Tom Landry coached there and Bill Parcells coached here. I hate Lawrence Taylor and Phil Simms and Michael Strahan. I hate their stupid nicknames like "G-Men" and "Jints." I hate they claim Pat Summerall and Vince Lombardi and Jim Thorpe. I hate Eli Manning's face and Victor Cruz's Salsa. I hate that Everson Walls and Chris Canty and even Jason Garrett played there after playing here. I hate their smug, elitist fans and media, and that they play in an entirely different state than their name. But mostly, I admit, I despise the New York Giants because they've beaten the Dallas Cowboys in eight of the last 11 meetings and went 4-0 at Cowboys Stadium. And in 2009 as New York christened the stadium in Arlington with Lawrence Tynes' game-winning field goal, an entire row of New York media stood and cheered. When reminded that NFL policy prohibits cheering in the press box, one writer hooted "Who cares?!" while another flung a stack of papers into the air as they gleefully, classlessly exited to the locker room. But I really hate the Giants. So ... if you can’t beat ‘em, steal ‘em? 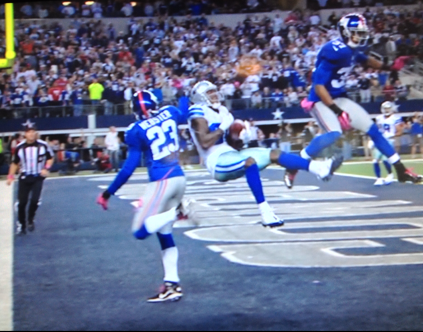 As we know all too well, the Cowboys are 0-4 against the Giants in Arlington. They’ve found a variety of ways to lose to their NFC East rivals in their relatively new home. Late leads. Empty comebacks. Blocked field goals. Broken collar bones. And last year, of course, Dez Bryant’s hangnail coming down out of bounds. If the Cowboys are to get off to a 1-0 start and instill confidence in their fans that 2013 will be different than another playoff-less 8-8 season, they’ll have to find a way to finally beat New York. Maybe Kyle Bosworth is the missing ingredient. Bosworth grew up a Cowboys fan and attended Plano West High School before attending UCLA. His cousin was Brian “The Boz” Bosworth, the enigmatic star linebacker who played at Oklahoma and for the Seahawks. A week ago Kyle was a Giant, preparing to play the Cowboys. But today he was at Valley Ranch, a Cowboy now preparing to face his former, familiar team. Doubtful an emergency role player like Bosworth will play a big part in the Cowboys finally beating the Giants at AT&T Stadium. Unless he can play pass defense, that is. In their four losses the Cowboys have averaged 31 points, but surrendered to Giants’ quarterback Eli Manning an astounding 1,228 yards and eight touchdown passes. Considering what Dallas has experienced against New York since 2009, Bosworth’s arrival can’t hurt. 2009: Giants 33, Cowboys 31 – Lawrence Tynes kicks a 37-yard field goal as time expires, ruining the debut of Cowboys Stadium and an NFL-record crowd of 105,121. 2010: Giants 41, Cowboys 35 – Tony Romo is sacked by Michael Boley and suffers a season-ending broken collar bone. 2011: Giants 37, Cowboys 34 – Cowboys blow a 12-point lead in the final five minutes and lose when Jason Pierre-Paul blocks Dan Bailey’s potential game-tying field goal on the game’s final play. 2012: Giants 29, Cowboys 24 – Rally from 23-0 deficit falls short as Dez Bryant’s hand comes down inches out of bounds on what would have been dramatic game-winning touchdown in two minutes. I know a loss is a loss, but man these games were close. Atleast they havent embarrased them in any of these games. Off topic I know, but with all your ripping of Johnny Football, doesn't it matter a little bit about the scam Aggie President is trying to pull? You blamed Johnny's family, how about blaming the Aggie President? Thanks RW, for reminding us all of last year's kick to the crotch. The fingertip grab that almost was... Alas, it indeed was a loss. But to shoehorn in a tired old phrase, that was definitely Dez Bryant's "coming out party" last year. Really looking forward to seeing his intensity Sunday night. For while a good chunk of the Cowboy fans might not remember it exactly, I'll bet #88 does. And hopefully, he'll use this to fuel the fire. I wonder who they are going to blame for this seasons melt down? Josh is gone. Uncle...the Boz was his uncle...GO CANELO! !